Here are Mother's Day jewelry crafts projects for kids to make as gifts for Mom on Mother's Day. The following arts and crafts activities are for making handmade jewelry, necklaces, bracelets, pins, etc for Mom as presents or gifts. Your Mom will love this thoughtful gift and it isn't hard to make at all. Find a Photo that your Mom will love to look at. Ask your father or other parental figure (other than your Mom) if you are allowed to use it to make a beautiful brooch. If you are allowed to, then you will need to find a cap to use. You may paint the cap if you choose to or just leave it as is. Trace the cap on top of the photo...making sure not to cut off any faces. 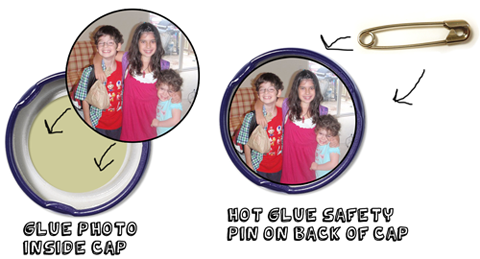 Then cut out the photo and glue it inside the cap. Cover your photo with clear glue or with a clear glaze. This will protect the photo from every day use. Next have your Dad or other adult help you to hot glue a safety pin or jewelry pin to the back of the cap. And that is all there is to it. Now you have made your Mom a beautiful jewelry brooch to wear every day! She will absolutely love it. This craft can't be much easier. The only hard part is going to the hardware store to buy a hinge ... the shape and color that you like. You will also need a ball chain with fastener, you can also get this at the hardward store. Find a few photos for the picture locket. Find out which way the hinge folds in...as the inside is the place to glue the photos. Then have an adult help you by gluing the pictures to the inside of the hinge. 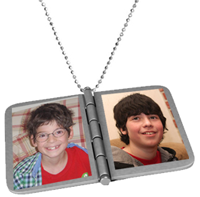 If your Mom has more than 2 children, glue photos on the outside of the hinge locket too. Thread the chain through the hinge and you've got a pretty beautiful necklace. This looks like a real locket and your Mom will love it because it is not only meaningful and thoughtful but it is also beautiful to look at. Decorative pins don't have to be made of gold or silver to be pretty. All the love that you put into this craft will make the shirt pin all the more beautiful to your Mom. Make different decorations and shapes from cardboard that you paint, cover with fabric or felt or decorative paper, or it could already be the color that you are looking for. For example...the flower above is just made from a large red cardboard circle and many smaller yellow circles glued together ... then some beads and a button were added for extra decoration. The 2nd picture above is a red cardboard circle with macoroni noodles as the petals to the flower and a button as the center of the flower. The first decorative pin above is a diamond cardboard cutout, wrapped with decorative paper. the center is a white button. When you have completed the pin, just have your Dad (or other helpful adult) hot glue a safety pin to the back so that your Mom can pin it on her shirt. Make a Beautiful and Colorful Cork Necklace- Paint corks in beautiful colors and use needle and thread to sew them onto 2 strings to make an elegant design. Give Mom or Grandma a Chocker Necklace - Your Mom or Grandmother would love to receive this lace choker necklace for Valentine's Day. Learn how to make it here.